It is the issue of rights that lies at the root of humanitarian efforts following disasters and emergencies, rights that should be equally available to all. Disaster preparedness and emergency response systems are typically designed for people without reduced mobility, for whom escape or rescue involves walking, running, driving, seeing, hearing, and quickly responding to instructions. Until today, the needs of PwD/older persons are not studied nor addressed by todays civil protection (CV) plans of the CB area. 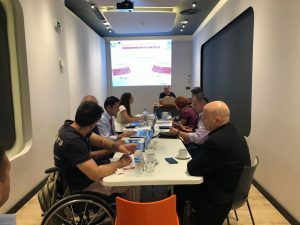 Following the provisions of Article 11, of the UN Convention on the Rights of PwD (UNCRPD) and relevant European Regulations (see section B.8.2), the 4Plus Project aims at improving CB preparedness for effective management of disasters for PwD/older persons based on an all-hazard, all-inclusive approach. Prepare plans for ensuring the sustainability and transferability beyond the CB area of the project outcomes and lessons learned (sustainability & transferability). The Project endorses a modern human rights-based, bottom-up approach (originality of the Project), which seeks to analyse the inequalities as well as to redress discriminatory practices and ultimately to have a strong impact on social inclusion, sustainable development and quality of life in the Programme area (added-value).